Preheat oven 180°C/160°C fan-forced oven. Line two 12-hole, 1/3 cup-capacity muffin pans with paper cases. 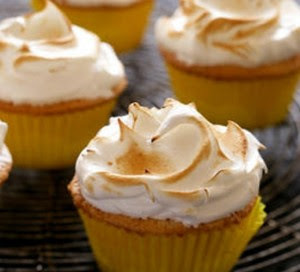 Make Basic cupcakes (see related recipe). Using a small sharp knife, cut a 2cm-deep x 3cm-wide round from the top of each cooked cake. Discard tops. Spoon 2 teaspoons lemon butter into each hole. Place cakes on a large baking tray. Increase oven temperature to 200°C/180°C fan-forced. Using an electric mixer, beat eggwhites and sugar in a bowl for 10 minutes or until sugar is dissolved. Spoon mixture into a large snap-lock bag. Snip a 1cm triangle from 1 corner of bag. Pipe mixture over lemon butter. Bake for 3 to 4 minutes or until tops start to turn golden. Stand for 5 minutes. Serve.